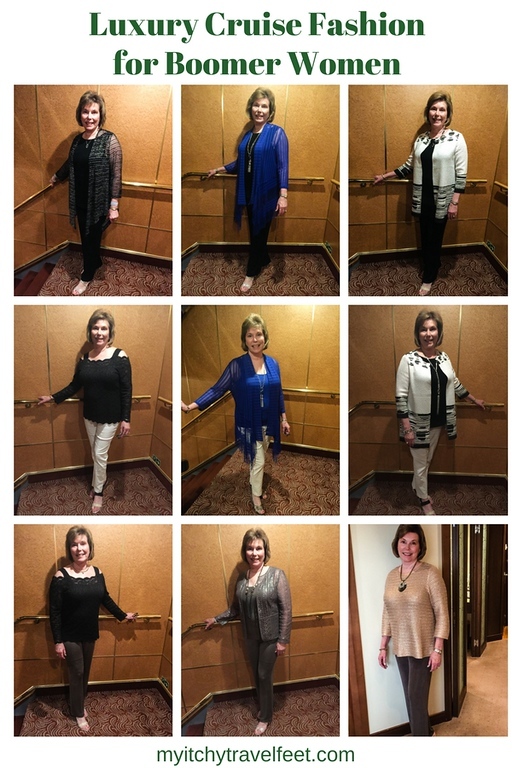 Updated 10.01.2018: After years of sharing cruise fashion photos on my Facebook profile, many of you have asked me to write more about cruise wear for over 50 women. 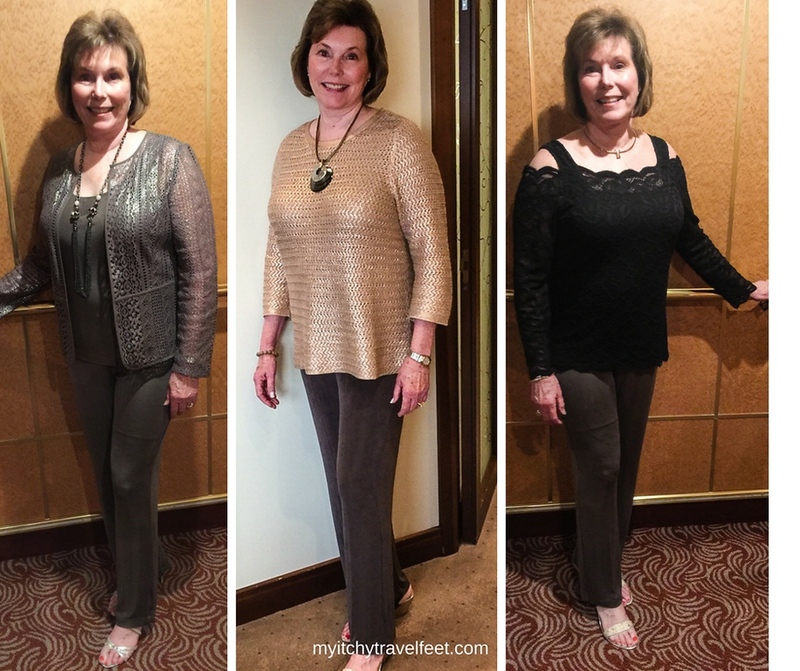 This is the first of a series of articles about what to wear on a cruise, especially luxury cruises, which is what I know best. One of the reasons that I enjoy luxury cruising is that I get to dress up. For most of my days in Montana, I wear exercise pants and a sweatshirt (or t-shirt in the summer). When it’s time to go out to dinner, I change into blue jeans, nice shirt and boots. Boring! Dressing up is part of the fun on a luxury cruise. A cruise changes that dynamic. It’s my time to dress up and be girly. Alan appreciates it. And I like that dressing up for a cruise is the push that I need to stay healthy and fit. Feeling good about myself is the end result. And at 67, that’s an important component to boomer health. What’s my secret? Picking a clothing line like Chico’s where the items easily mix and match to create many variations of an outfit. I don’t claim to pack light, but I do plan an efficient cruise wardrobe. My rule of thumb: wear an item at least twice or put it back in the closet. How do I accomplish this? 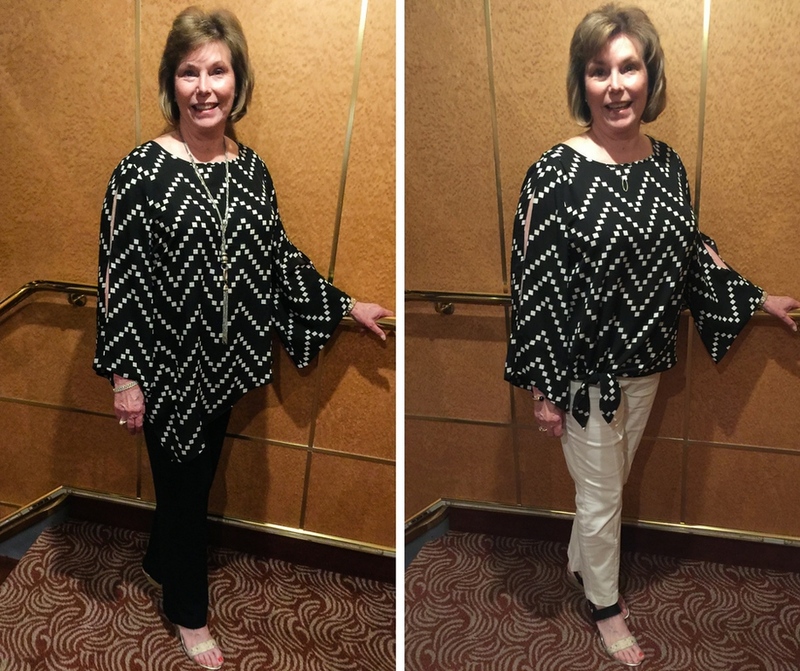 On a 21-day cruise, I’ll pack about 3 to 4 pair of pants for evenings, with a color scheme that allows me to mix and match the tops to create different looks. Who wants to wear the same thing each night? Not me! I might as well be back at home in Montana dressed in sweatshirt and warmup pants. 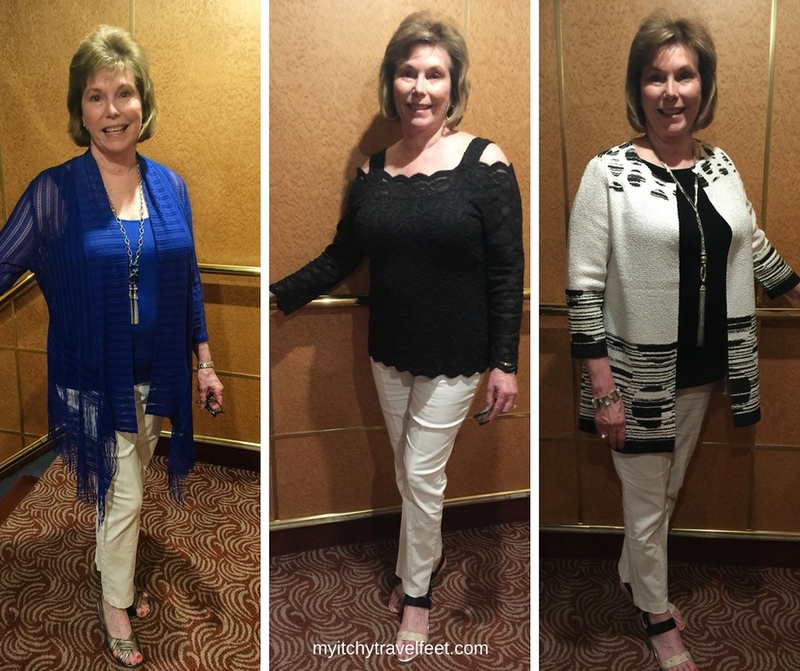 To start this cruise fashion series off, I’m sharing some of the looks that I wore on a 42-day cruise from Hong Kong to Vancouver. There were 6 formal nights and 36 elegant casual evenings. 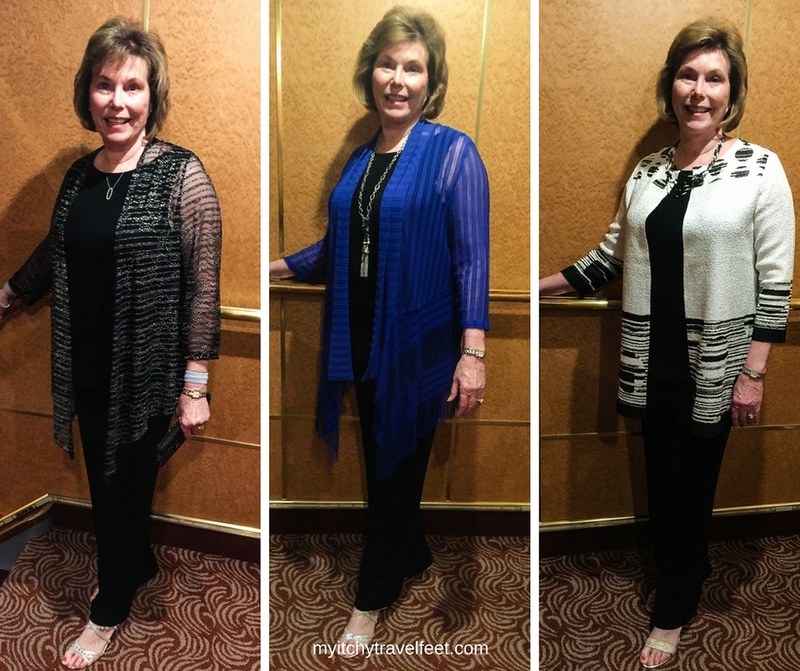 In this article, I’m showing ways that I combine pieces of clothing to dress for a cruise. Look for more articles on formal nights, warm weather cruise wear, cold weather cruise wear, adventure cruise dressing, and packing strategies later this summer. For now, let’s take a look at some of the clothes that I’ll be wearing. And sorry about the lighting. I’m not a big fan of taking photos of myself (I’m shy) and usually seek out a private area to photograph the outfits rather than a well-lit public area of the ship. After moving to Tucson many years ago, I discovered Chico’s. The clothes fit me, they’re easy to mix and match—especially with the knowledgeable help of a Chico’s associate—and pieces carry over from one season to another, with the addition of one or two pieces to freshen things up. Once I figured out my style, for me that’s pants that are slimming and long tops with a classic look, I became a happy customer. That’s right, Chico’s doesn’t pay me to write about them. Now on to cruise outfits. I’ve gotten a lot of mileage out of this black travelers pants and tank top. And I especially like that Chico’s has narrowed the pants leg to match the current styles. Remember how baggy travelers pants used to be? In the first photo, I’m dressed for formal night with a sheer sparkly long sleeve jacket, silver sparkly shoes, dressy jewelry and black evening bag. No, it isn’t ultra formal but the understated look fits right in on most formal nights. The second time I wore this outfit, I topped it off with a royal blue fringe jacket and long necklace. This look would work for either informal nights or elegant casual (although I’d change out the shoes for elegant casual night). The third outfit pairs a geometric black and white jacket, casual necklace and shoes, with the same pants and top. Three different looks! White So Slimming Brigitte ankle pants. Now let’s switch to white pants. This is the 2017 version of the Chico’s So Slimming Brigitte ankle pants. I’ve added a blue tank to the blue fringe jacket for a more casual outfit. The center photo showcases my favorite top. I think it’s a much better look than cold shoulder tops. And, as you’ll see in the next series of photos, it can be dressed up or down. The third photo shows a black travelers tank with geometric white and black jacket, worn with a long silver necklace. This black and white geometric blouse goes from dressy to casual. And here’s an example of how versatile a top can be. Worn loose over black travelers pants, the top looks somewhat dressy. Tie it at the waist, over a pair of So Slimming pants, change out the jewelry and the look becomes more casual. And, you’ll notice, the sleeves have slits in them. Again, I like this better than a cold shoulder top. Taupe travelers pants for 3 different looks. But who wants to wear black and white ALL the time? Let’s add in a third color. I’ve worn these taupe travelers pants for several years. In the first photo, I’ve combined the pants with a matching tank and lace jacket. Add sparkly silver shoes and a malachite necklace and I’m ready for formal night. Yes, I’ll be understated but will still feel that I’m appropriately dressed. The peach sweater in the middle photo came from the 2017 fall collection. Now the pants work for elegant casual night. And the shell necklace is a really old Chico’s find. And that’s the beauty of my favorite clothing line. One or two pieces and I’ve updated my look. The last photo shows that yes, black and taupe do go together, especially if you wear gold jewelry. This isn’t all that I packed for 42 days, but this gives you an idea of how I mix and match cruise wear. 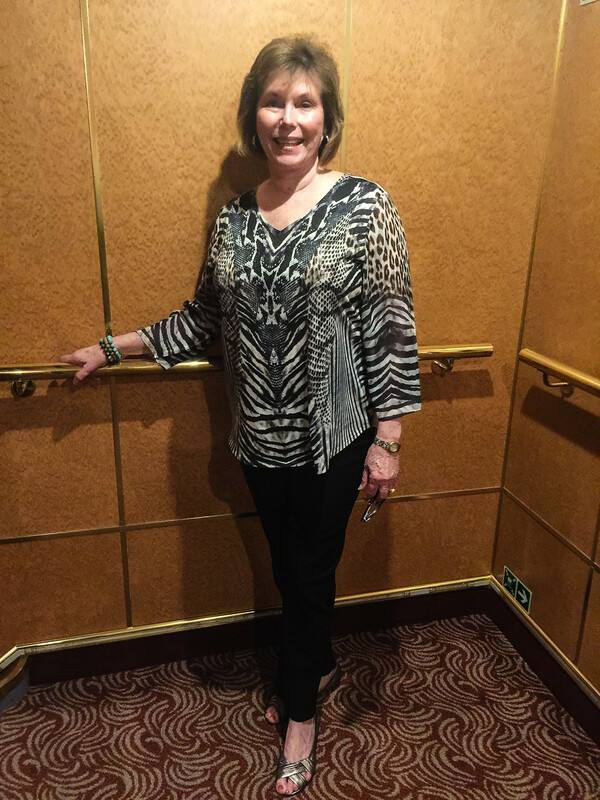 Do you have questions about dressing for a cruise? I’ll try to answer them or turn your questions into a future article. Email me here.